Editor's Note: 'Our Colorado' helps us all navigate the challenges related to growth while celebrating life in the state we love. To comment on this or other Our Colorado stories, email us at OurCO@TheDenverChannel.com . See more 'Our Colorado' stories here. PARKER, Colo. — In our growing Colorado, we often hear stories about displaced people or communities worried about the change that comes with new developments. In Parker, a push to keep out an affordable housing subdivision has given way to now a fight to protect the wildlife on that land. The view from Mark Snyder's balcony is likely to change. A developer has plans for affordable housing subdivision in the Stroh Ranch neighborhood of Parker at the intersection of Nate Drive and Ironstone Way, directly next to his condo. 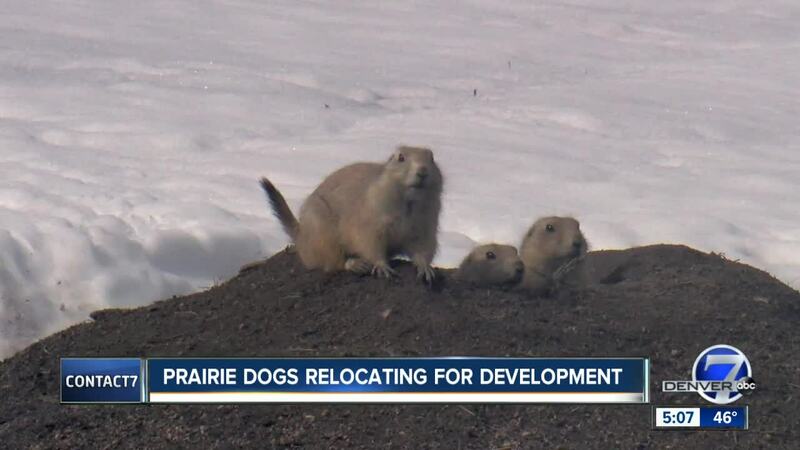 But that means the current residents, a colony of prairie dogs, will have to go. "Developers don't relocate them. They kill them,” said Snyder. "They take pellets of the poison, and they put them in each of the holes and they seal them. If any state would protect its wildlife, you would think it would be Colorado." If you ask others, the prairie dogs are just a problem. "They’re kind of just a nuisance to me. They just dig holes. There’s plenty of other places they could be and Parker's growing. There’s no stopping Parker right now,” said Parker resident Adam Maes. Snyder told Denver7 hundreds are living on the lot and that he’s tried to talk to the Town of Parker about saving them. "They're not a nuisance. I mean what are they doing? They’re just living. As you can see they’re very passive animals. They don't leave the boundaries of their colony," said Snyder. A Parker media spokesperson, Andy Anderson, did not want to comment on camera but did tell Denver7 when concerning prairie dog matters, the city follows the state of Colorado’s lead. Since they are not an endangered species, it’s up to the landowner on how to handle them. "I’m relying on the sympathy, the empathy and kindness of a developer right now," said Snyder who has talked with the developer, Dominium Apartments. Snyder said the developer listened to his concerns and was willing to accommodate the relocation of the animals, as long as Snyder mainly handled the cost and responsibility. Snyder is reaching out to prairie dog rescue groups, and in the meantime, he hopes the city will step up and do something about it. “Maybe that's the point of me raising this concern. Maybe I can’t save this plot of prairie dogs, maybe they will all die," said Snyder. But he hopes in the future others will be saved. "The city of Parker they should be creating ordinances that require these builders to relocate the wildlife. They’re the ones to blame," said Snyder. To help Snyder’s cause visit his fundraising page.